To everyone who loves to dance! 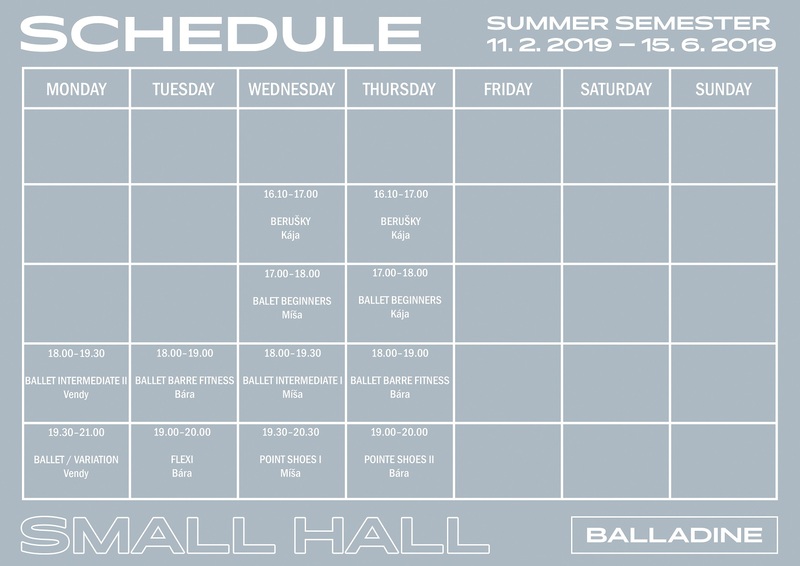 The Balladine Dance School was founded in early 2012. The main mission of the school is to teach classical ballet for adults and children. 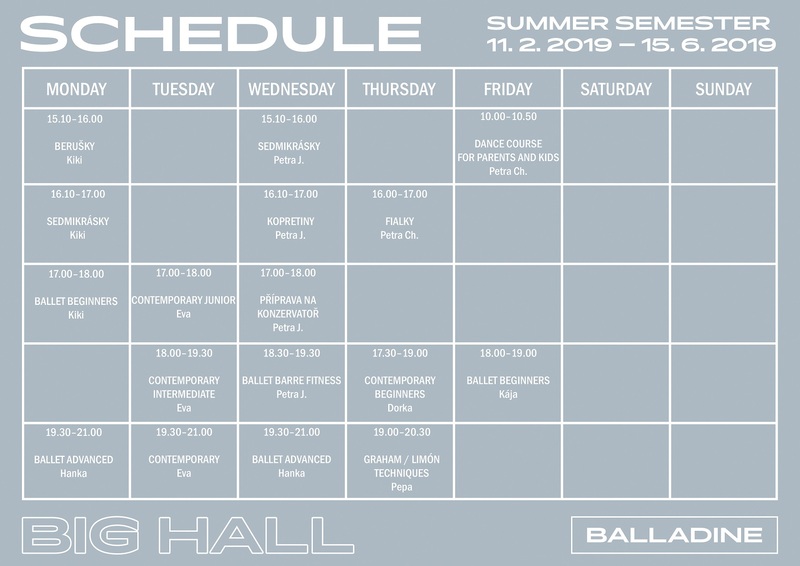 During the first three years, the range of courses and activities was expanded, resulting in the opening of their own dance studio in February 2015 in the centre of Brno. Currently, the school has a wide range of courses including several dance and exercise styles. We teach classical ballet for adults and kids, contemporary dance, flexi/stretching, ballet barre fitness and we offer lessons in english. Our school organizes various workshops with external lecturers, summer schools, preparation for conservatories, suburban camp for children, happening in the streets, parties and so on. Our pupils participate in various competitions. In Brno, we are trying to create and support the dance community and we cooperate with various artists and places. In 2018 we moved into larger spaces and we also have a cafe named Attitude in it. Our courses are designed for everyone who wants to get into the secrets of graceful dance art. All people without difference have dancing talents! We all love the freedom and euphoria we can live through dancing. We develop our ability to coordinate movement, sense of balance, correct posture, and lose weight in swimwear if it is our goal. Dance makes us more beautiful. Dance art can also be a gentle and beautiful alternative if we need to repair our back or get rid of other health problems. Thanks to dancing, we express and share our emotions. The first lesson is trial, so you can choose and try more lessons. After the first lesson you can get an application form on our reception, please fill it and leave it there. You can visit any lesson even during the semester, but before you come, write us an email please balladine@balladine.cz. The price is for whole semester. Its necessary to make a payment for your course 7 days after filling your application. You can get an application on our reception or you can download it here. There are other important information about processing personal data etc. Please, use your date of birth as variable symbol (DDMMYYYY) and write your name, surname and course name to notice of your payment. If you want you can pay by cash on the reception. The price is for one class a week. 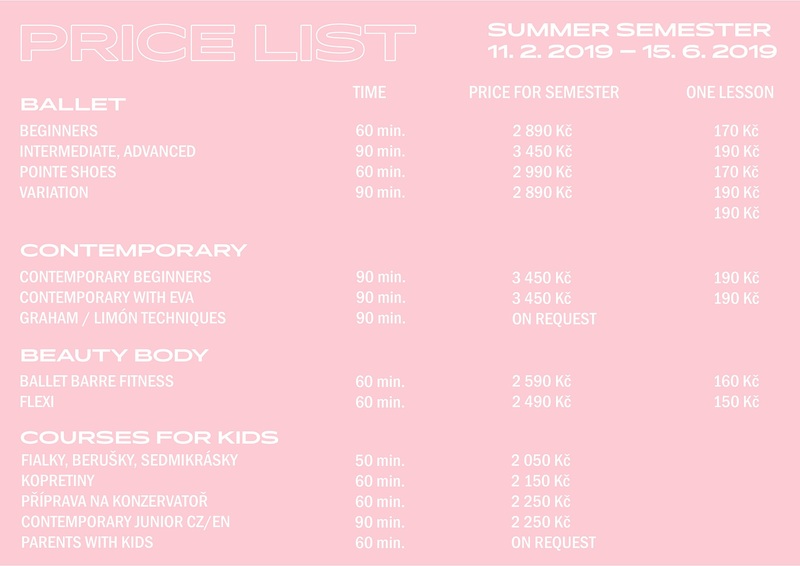 If you choose two (or more) of our classes (in one week), you can use 10% discount for both (or more) courses. (For example: you will visit ballet in english and flexi). We recommend to you to attend whole course, its better than pay single class, because every class follows to another. If you are student, there is also 10% discount. We offer also individual lessons or you can rent our studio. For more information dont be hesistate to ask > balladine@balladine.cz.